The abdomen is the region between the thorax and the pelvis, stretching from the diaphragm to the pelvic brim. A study of the cross-sectional anatomy of this region gives us a visual medium that facilitates the understanding of its structural organization. Cross sections will permit an unique view of the positions, sizes, shapes, and relationships of the structures located in the abdominal cavity. The bony framework of the abdomen consists of the five lumbar vertebrae, together with their corresponding intervertebral discs situated in between; and the lower six ribs and their cartilages, which are also considered part of the thoracic wall. A variety of muscles can be seen in the abdominal region, depending on the level of the cross section. Anteriorly, there are the three layers of flat skeletal muscles: transversus abdominis, internal oblique and external oblique; and a vertical muscular layer of the rectus abdominis and pyramidalis muscles. Posteriorly, the main muscles present are the quadratus lumborum, psoas major, erector spinae and the latissimus dorsi. An abdominal cross-section reveals a variety of organs. That includes those belonging to the digestive system: the stomach, large intestine, small intestine, as well as other accessory organs including: the liver, gallbladder, pancreas, spleen, two kidneys and two suprarenal (adrenal) glands. The arteries present in the abdominal region include the abdominal aorta, which can be divided into anterior, lateral and dorsal branches. Both the anterior and lateral branches are distributed to the viscera, while the dorsal branch supplies the body wall, vertebral column, vertebral canal and its contents. The aorta then bifurcates to terminate as the right and left common iliac arteries. The anterior group includes the celiac trunk and the superior, and inferior mesenteric arteries. The lateral group includes the suprarenal, renal and gonadal arteries. The dorsal group includes the inferior phrenic, lumbar and medial sacral arteries. The veins present in this area are conveyed by the abdominal inferior vena cava together with all of its tributaries. The nerves present in the abdominal region belong to the autonomic nervous system and they originate from the splanchnic nerves, and the vagus nerve (CN X). That includes branches of the lumbar plexus as well as numerous other plexuses (aortic, celiac, hepatic, renal, mesenteric, and hypogastric) and ganglia. 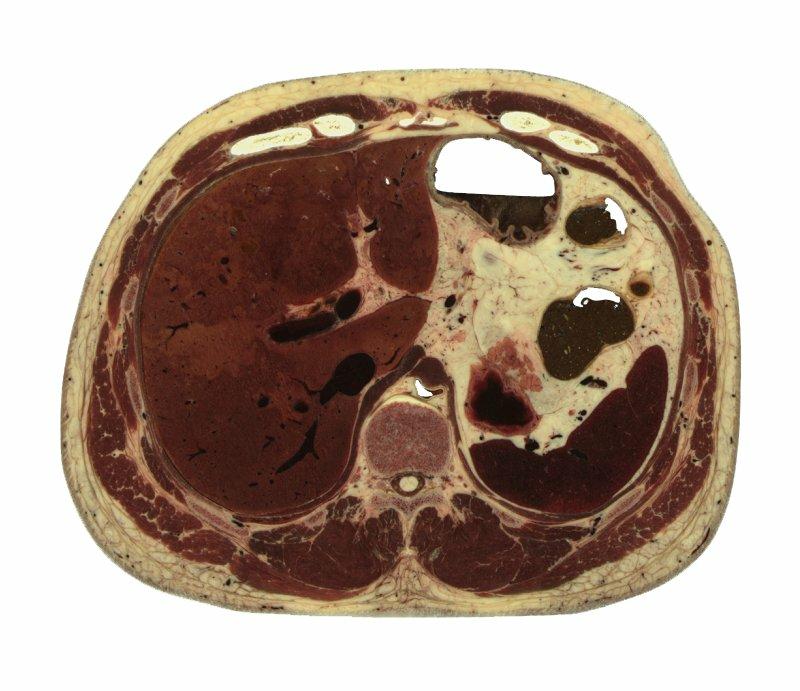 Computed tomography (CT) and magnetic resonance imaging (MRI) are indispensable tools for evaluating conditions involving the abdominal region. Both of these modalities depend on the cross-sectional analysis of complex anatomic structures in this area. The scanned structures can be reformatted in multiple planes and generated into three dimensional images. That plays a vital role in clinical practice and aids in the diagnosis of various abdominal diseases like: infections (e.g. appendicitis, pyelonephritis), inflammatory bowel conditions (e.g. Crohn’s disease, ulcerative colitis), cancers of the various organs present in the abdomen, kidney and bladder stones, aneurysms, swellings, and bleeding in cases of trauma. CT and MRI scans can also be used to guide biopsies and surgical procedures, as well as monitor the effectiveness of treatments like in cases of chemotherapy. Want to learn more about the Abdomen?